In my last post, Not Worth the Wait, I complained about my research experience with USCIS, the U.S. Citizenship and Immigration Services. Sometimes I complain for effect – that is, to get a response. This time I was just publicly venting for no reason other than to post about my mysterious letter and lack of photographs. So I was surprised when I received an email from USCIS’ Chief of the Historical Research Branch. Apparently word gets around (I didn’t realize the Department of Homeland Security read my blog)! I was very happy that they took the time to contact me, so I’d like to present what they had to say as a follow-up to my previous rant post. The first error was my own. I complained that I had the file number all along and didn’t need the index search. But, apparently if I had looked a little more closely at the information on the USCIS web site, I would have realized the index search was not necessary at all. Next, USCIS apologized for what I referred to as their “amusing letter”. The letter used a “boiler plate” format, and two reviewing offices missed the grammatical errors. The omission of the letter from the copy sent to you by Genealogy was our error. I am currently reviewing all record request procedures with the Genealogy supervisor to ensure the same error does not occur again. When a naturalized citizen was convicted of a crime, the court would notify the cognizant INS office. The office would then investigate to see if the person had committed any crimes in the five-year period prior to their naturalization. 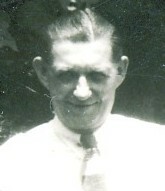 In my great-grandfather’s case, his record was clean and this was his first offense. Now that I have a legible letter with a conviction date, I can investigate further. And maybe, like Sheri suggested in the comments of the last post, find my missing photo. Unfortunately it will be a mug shot, but a photo is a photo! USCIS said, “We do our best to learn lessons from experiences such as yours to improve the USCIS Genealogy Program.” This is great news to genealogists everywhere! One of the dangers facts about being a genealogist is that no matter what you read, you will read it through a genealogist’s eyes. It’s like having a genea-lens, and your observation of the world focuses on different things. My genea-lens zoomed in…American citizen, eh? We’ll see about that! So I set off to find the good sister’s immigration record and naturalization papers. And, because some of our government records are as trusty as the good-old-Catholic-school permanent record, I found it! The first American-citizen saint was born Francesca Saverio Cabrini on July 15, 1850 in Italy. She was 27 years old when she became a nun and added the name Xavier in honor of St. Francis Xavier, a Jesuit priest. Sr. Frances Xavier Cabrini became a teacher, and she eventually founded an order of missionary sisters in 1880. Although her hope was to travel to the East as a missionary, the Pope asked her to instead travel West to minister to Italian immigrants in the United States. 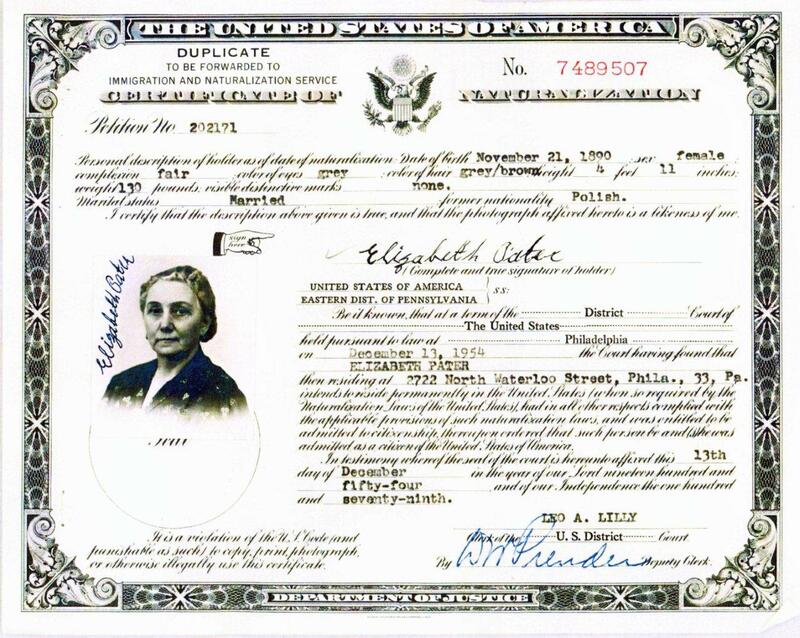 She immigrated herself in 1889 and petitioned for citizenship in 1909. By the time of Mother Cabrini’s death in 1917, she and her order had founded 67 schools, orphanages, and other institutions throughout the United States as well as in Europe and South America. She became a saint in 1946 and is the patron saint of immigrants. 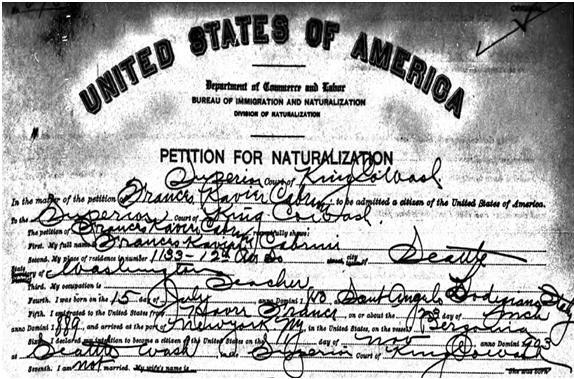 So the next time you’re researching passenger arrival or naturalization records, use your genea-lens. Who knows, maybe your ancestor stood in line with a future saint to enter this country!